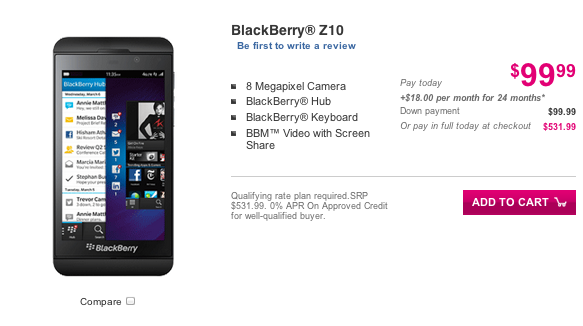 T-Mobile’s BlackBerry Z10 is officially for sale for $99 down payment with an additional payment of $18 for 24 months. Welcome to the UNcarrier’s first official LTE smartphone launch. The BlackBerry Z10 features a 4.2” 1280×768 356ppi display, 8 megapixel camera, dual core 1.5GHz processor, 2GB RAM, 16GB internal memory expandable to 32GB, 1800mAh battery, and HSPA+ and LTE connectivity. Given that Classic and grandfathered upgrades are now available through third-parties and authorized retailers, upgrade pricing will vary based on retailer. ← T-Mobile’s First LTE Markets Slowly Coming Online As Of Last Night? Pogi!!!!!! long time no see mayn? been hiding mayyyn??? Yes sir!!! but I will be picking up htc one n iphone..I hope they have more details soon..
LTE with a 1800 mAh battery? Is the battery removable/replaceable? Really? Why do you think so? And what about iPhone? Totally got the z10 and I love it!!! Argh! When will T-Mobile stop with the different prices? They just tried to charge me $569.99 plus tax in the store. The website says $531.99 plus tax. Did you get the Z10? I emailed John Legere on this one. Let’s see if he responds. The problem that I have with this is that the asterisk is next to the $18 per month for 24 months statement, not the $531.99. This implies that the “Qualifying rate plan required” only applies to the EIP, not the full-price purchase. I agree with you. I want the Z10 but am holding off until this is figured out. I would have walked in expecting to pay the $531.99 plus tax. I thought that you liked to use the EIP pantherlady. Did you not want to change from Value to Simple Choice (assuming that it’s required)? For $532, I’d rather just buy the phone outright. I’m using my EIP for my Note 2 right now, but will pay it off so I can get my daughter the iPhone for her birthday. I’ll use the EIP then. John Legere responded, along with others from the Executive Response Team. Basically, the $569.99 price stands. I was told that the $531.99 price is only for customers coming to the Simple Choice plans. I am not happy with this response. I didn’t see that the website specified that, did you? Not good at all. Was going to try buying one of Craigslist but Customer Care confirmed that any unpaid balance for the phone from the original purchaser (if they used the EIP) would result in the IMEI # being blacklisted no matter how long I had the phone. No, that was the majority of my complaint, that the $569.99 price is not listed on the website, the sign in the store, or even when I asked the sales person and explained that I was an existing Monthly 4G customer. Because this looks like false advertising to me, I sent this to the BBB. I like T-Mobile (or I did), but they have to do better than this. They used to put all of the different prices on the in-store signage; they should have done that this time, as well. The IMEI number blacklist is one way that buyers can get burned on Craigslist and Ebay. I’ve seen too many negative things happen with Craigslist purchases for me to want to go that route.